Location. Positioned just two blocks north of the Fremont Street Experience in Las Vegas, Main Street Station Hotel, Casino and Brewery brims with memorabilia reminiscent of San Francisco’s early days. Guests traveling by air are nine miles from McCarran International Airport. Hotel Features. 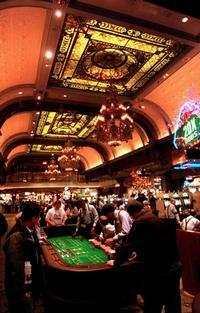 This venerable Nevada lodging boasts a 27,398 square-foot casino with 943 slots and twenty-one table games. The interior gleams with ornate chandeliers and ceiling fans that hover over an old-western-style front desk and cashier cages. Gas lamps, brass fixtures and antiques transport guests back in time to turn-of-the-century San Francisco. The hotel’s exterior is defined by flickering gas lamps, wrought-iron railings and stained-glass windows. Dining options include the Garden Court Buffet, which as of 2006 ranks as the area’s largest buffet and 777 Restaurant and Brewery offers hand-crafted beers, pub fare and even fresh seafood via a sushi bar. The Social Club seats up to 160 guests and is also available as a banquet facility. Guestrooms. This property offers 406 rooms with French Provincial-style furnishings, including white plantation wood shutters. Some accommodations face the freeway or railway tracks, but quieter rooms provide cityscape perspectives. Dial-up Internet access is available, and rooms include safes. Expert Tip. Theodore Roosevelt’s Pullman railroad car is located on the hotel’s premises, as well as a section of the Berlin Wall.